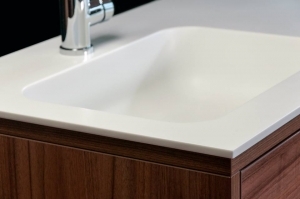 Marlan® Solid Surface is a beautiful material to apply in your kitchen or bathroom. 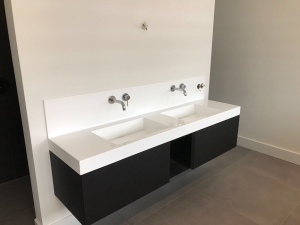 Ask your interior builder about the possibilities, or contact us if you are looking for a professional interior builder who has experience with Marlan® Solid Surface. Solid Surface is often applied as counter top. It offers several advantages, like seamless glue joint, chemical-resistance, durability, natural appearance, and a touch that never feels cold. Marlan® Solid Surface plates are available in all colors and in a maximum size of 3670 x 1250 mm. Besides, Marlan offers the following thicknesses: 6, 12, 18, and 24 mm. This can save much work, especially with kitchen islands, because the plate can be mounted as a whole and does not need any glueing. 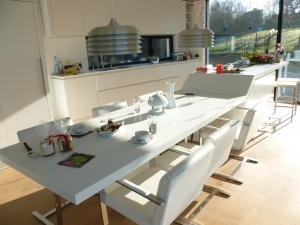 Below you find some examples of kitchens with Marlan® Solid Surface. 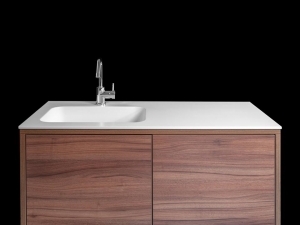 Solid Surface is increasingly applied in bathrooms. For example, the demand for custom-size shower floors in homes is increasing. 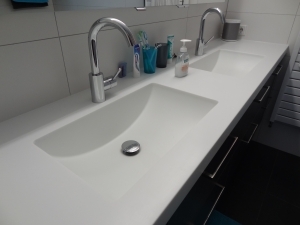 The processability of Marlan® Solid Surface offers many possibilities. For instance, it enables seamless ridges, thus preventing the need to use caulk. For these objects, we always advise to bring in a professional installer or interior builder. They are experienced in placing our beautiful product and can provide an optimal result. In case you do not know a professional who can do this for you, you can contact us. We will put you in contact with the right professional. These photos are only a small selection of the many possibilities with this beautiful material. Ask your interior builder about further possibilities or contact us for samples or advise.